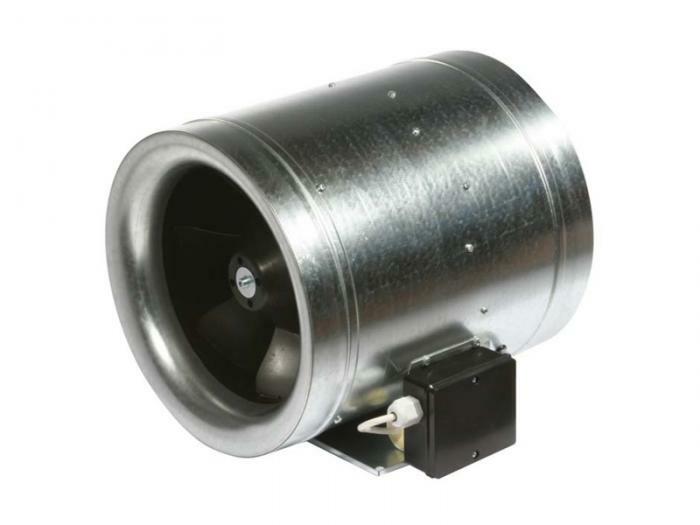 Very compact mixed flow duct fan with high efficiency. Especially built for use with round ducts. The diameter of the duct is not exceeded by the fan housing, DCF-503 Inline Duct Fan can be used in small spaces. Thanks to the special design of the three dimensional blades of the rotor and the stator, these blades are driven correctly, thanks to which the pressure profile on the surface of the blades is realised more efficiently and with considerably less losses. The efficient stator will convert the energy losses (dynamic pressure) into useable energy (static pressure). This combination results in a duct fan with the highest efficiency in its category, whereby the DCF-503 Inline Duct Fans cut operational costs enormously. Thanks to the fact that the motor is integrated in the stator’s hub, out of the air stream, the DCF-503 Inline Duct Fans can be used for slightly polluted air. Compact fan housing with mounting bracket included. The fan housing is made out of synthetic fibre for diameter 200mm, galvanised steel for diameters from 250mm to 355mm and seawater proof aluminium for diameters from 400mm to 630mm. The mixed flow turbine and stator are made out of synthetic fibre for the diameters from 200mm to 355mm and of seawater proof aluminium for diameters from 400mm to 630mm. The motor is equipped with maintenance-free, long-life ball bearings. Junction box IP44 with cable gland.